Wow. Here we go. I have a ‘bike hack’ for you. Or perhaps a bike life hack (#BikeLifeHack…). I doubt I invented this hack. In fact I definitely didn’t – I heard about the concept in a more general sense on one of the podcasts I listen to. I have just tailored the hack to suit my cycling life requirement. I can’t imagine it’s trademarked though. Even if it’s not, I don’t want to be labelled the Keith Chegwin of the bike hack world*. You’re right – that’s enough disclaimers. So What Does This Hack Do? Well, you know that dithering that occurs before you go out on a ride? You myfanwy about going to the cupboard to get your water bottle. To the shoe dumping ground to retrieve your bike shoes. You schlep to the coat rack to grab your gilet that for some reason you hang up there and it always gets caught on its own hanger and then pulls down the coats next to it and it may or may not have in the rear pockets your lightweight rain jacket and mini pump. Then you remember that for some reason you keep your bike computers (yes, two – I’m an aspiring cycling blogger tech reviewer, natch) in a drawer in the computer desk in the study. You’re fully lycra’ed (and gilet’ed) up and you haven’t put on your heart rate strap. It’s upstairs in the bed room and you’ve already got your cycling shoes on. Yeah, well you know that rage that builds up over 15 minutes as you try to get out of the house? The rage that is only surpassed by the rage you feel when you remember as you’re retrieving the bike from the garage that your filled water bottle is sat quite merrily by the sink? Well my hack solves that problem. So What Is It Oh Wise One? It’s a Cycling ‘Go Box’. So the concept I heard on the podcast was about these things called ‘Go bags’. Go bags are essentially, er, bags that you have filled and ready with the gear and supplies that you might need to undertake a particular outdoors activity. You keep them somewhere handy and grab them as you… go (yes!) out the door to undertake said activity. These people on the podcast were talking about having go bags ready with stuff for the beach (swim gear, picnicky stuff, bats and balls) so that, on a whim, say, after work, they could grab the go bag and head out the door. I think they had other go bags prepped for other stuff as well (maybe nuclear apocalypse?). The primary purpose of the go bag is to have everything ready, to reduce the time it takes, at home, to get organised for an activity. To reduce the friction that either shrinks the time you have to enjoy the activity in question, or causes you to sack it off as being absolutely too much hassle. 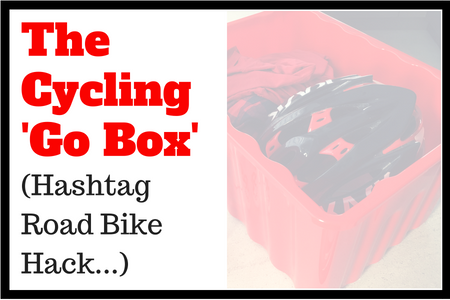 The Cycling Go Box is like a go bag…. but IT’S A BOX! You will love the simplicity and efficacy of this idea. For 2 seconds and then return to your state of underwhelm. 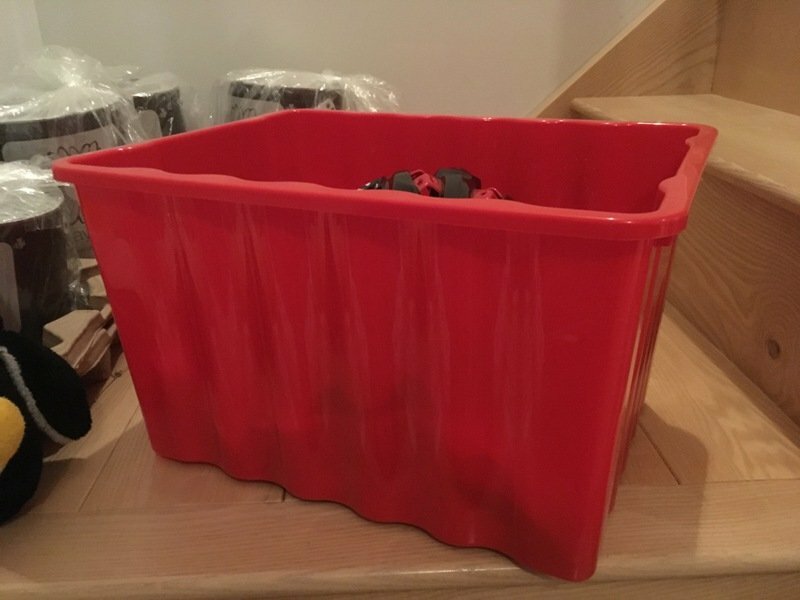 Basically, I went to B&Q (other DIY/hardware stores are available) and bought a plastic box. 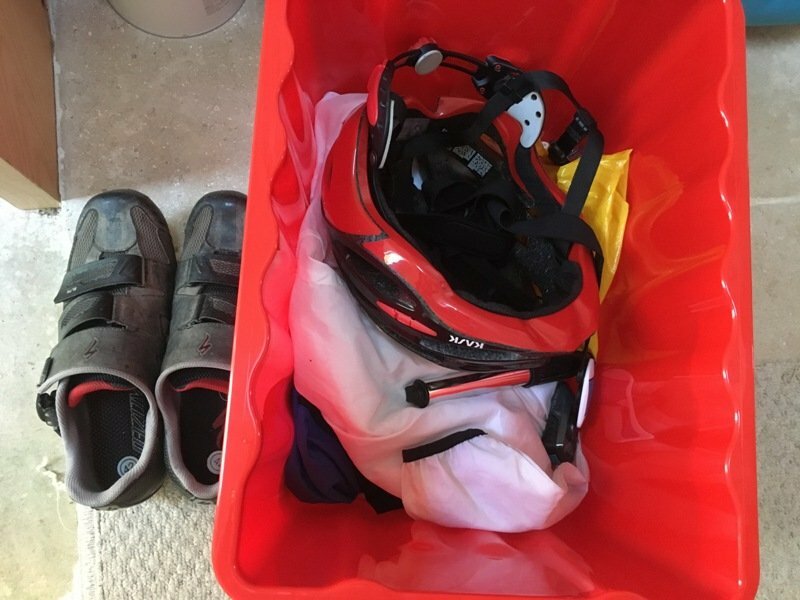 Well I didn’t science too much about it but I guess I was thinking about the size I have available on a shelf in our utility room and the fact that I’d want it to contain my helmet plus some other stuff. For the record (guv) the box is 25cm by 50cm looking down on it, by 37cm deep. If my velomaths is right, I think that’s about 46 litres. It does indeed (comfortably) fit my helmet within its confines. other things that I’ve forgotten as I’m writing this post in a place other than where my Go Box is. 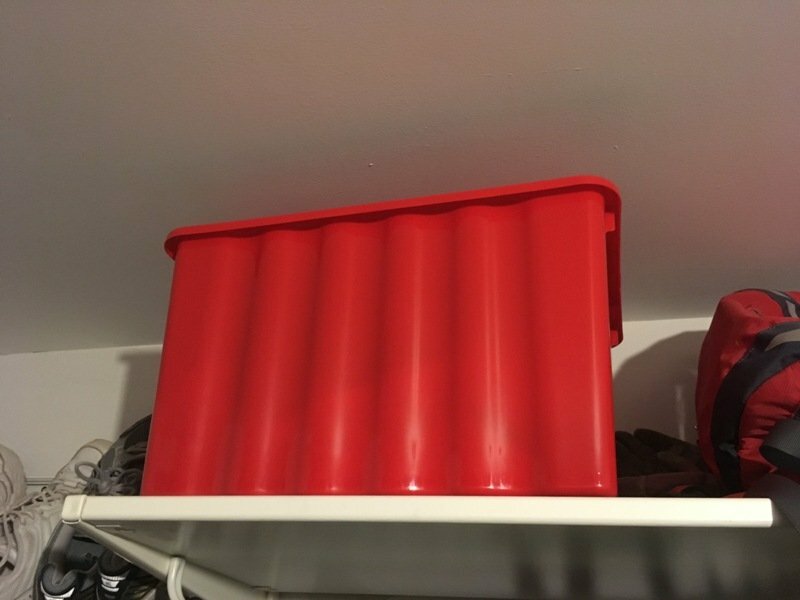 I don’t keep my shoes in there as I do a poor job of cleaning them generally. Also, with them having Speedplay cleats attached, there tends to be some grease knocking around the soles. If you keep your shoes clean, there’s no reason why they can’t go in your Go Box. In fact, now I think about, another item in the box is a yellow plastic bag (because, you know, Tour de France). From time to time I’ve kept my cycling shoes inside the bag inside the box (inside the utility room inside the house). So you could do that. There is no way I’m underselling this concept it would appear. Having a Go Box is not just about being ready to go for a bike ride when time and opportunity strikes at your home service course. Having a Go Box makes packing your bike stuff a breeze when you’re going away for a few days and hoping to slot in a ride or two in these new environs. Before a recent trip to Yorkshire (home of cycling… and Montgomery), I threw a couple of pairs of bib shorts and the same number of jerseys into the top of the box. It was then the first item that went into the boot (trunk) of the car. 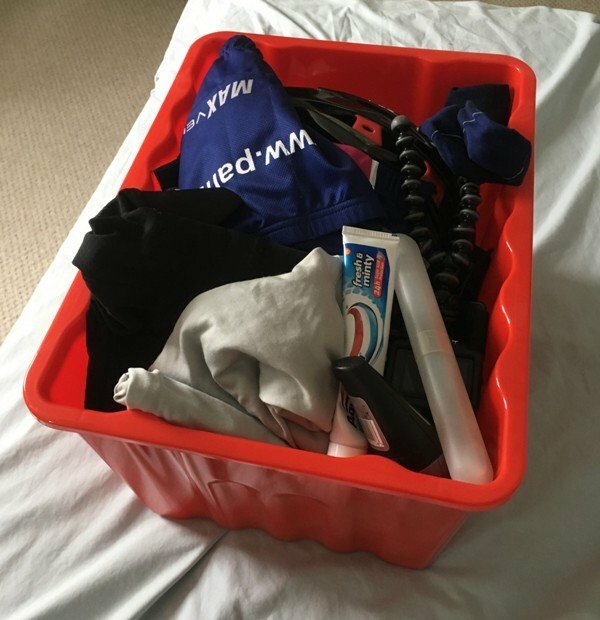 Confession time: this is my Go Box packed for RideLondon, rather than the Yorkshire trip… go(box) sue me! Cycle packing was done and I could concentrate on the main event (chivvying my children along so that we could manage to leave the house before nightfall…). Having the Go Box essentially permanently packed for a trip reduces the risk that you just can’t be arsed to think about cycling-packing at the crucial point, and your future ride happiness gets sacrificed on the alter of ‘too much hassle’. What with all these #lifebikehacks, I’ll be telling you I’m getting a GoPro next. I HAVE bought a GoPro. 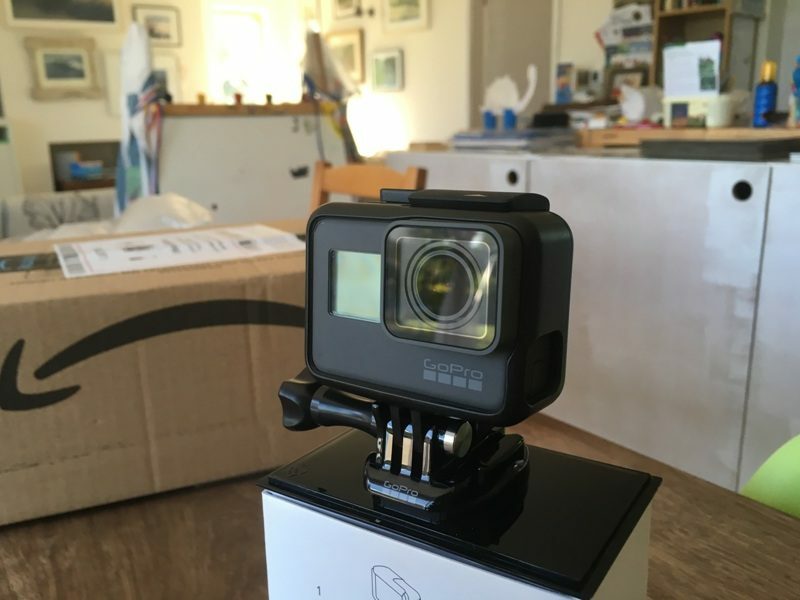 It’s a GoPro Hero5. I’ve got this daft idea that I’ll record rides, climbs, tips and #morehacks and post them on Youtube for you fine folk (and others?) to enjoy. Anyhoo… does anyone else have any neat cycling storage solutions? Perhaps a well-appointed workshop we can all salivate over? Hell, a tidy garage will do. Triathlete “transition bags” work, too. Nice way of keeping all the gear together. Remember the movie Taken with Liam Neeson? He had a similar box near the front door. Almost the same contents except I believe he included a nine millimeter, a couple of extra clips of ammo, several passports and a couple thousand in cash. Who knew you and Liam were so alike! Love your posts!! I’ve got a Rhino tub for just this purpose. It has shoes, helmet, gloves, phone mount, heart monitor & strap, cycling glasses, and a few gels. Hate to play the ‘female’ card but who doesn’t put everything in one place so it’s handy? Men? Mostly? All my gear, limited to helmet, glasses, Lycra, computer are all ready to go in labelled drawers, cycling tops, cycling bottoms, ‘rest’ and shoes under the chest of drawers. Easy Peasy. Well I guess some people need to market stuff, if your pinched for space or cash, there’s always IKEA! Nice thought ! Now onward I keep a GO Box.